This is an 8-Inch powered subwoofer capable of producing 60 watts (RMS) output. The subwoofer has a frequency response range of 50 to 250 Hz with a lowpass crossover filter, which can be adjusted from 50 to 150 Hz. Gain and frequency knobs on the control panel allow you to adjust the crossover filter and the power output for the optimum blend and balance of bass output with your stereo or surround speakers. The subwoofer has multiple input options, which allow it to be used with any existing stereo or 5.1 (or greater) amplifier system. For each input there is a corresponding output. High-level inputs accept a full-range signal from the amplifier's stereo speaker outputs. When connecting the unit as part of a 5.1 system, these would be taken off the Front Left and Front Right outputs in parallel to the standard pair of front speakers. The subwoofer provides its own power and includes impedance matching circuitry, so this will not reduce the power output to the front speakers or affect the overall impedance load on the amplifier. Additionally, the subwoofer has a set of right/left Line Level inputs. If using a standard stereo system, without a special subwoofer output, you can connect these to the left and right line level outputs on the amp. The subwoofer will then combine the signals to process the mono bass signal it needs to drive the speaker. If you are using an amplifier with a single mono subwoofer line level output, simply use an RCA -Inch-Inch cable to split the output and send it to the two line level inputs on the subwoofer. 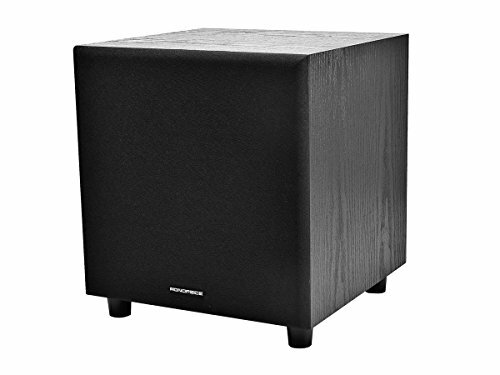 The subwoofer is housed in an attractive black wood cabinet that measures 13.75-Inch x 11.75-Inch x 11.75-Inch (H x W x D). The driver and a 2 3/4-Inch sound port are located on the front, covered by a black cloth speaker grill.